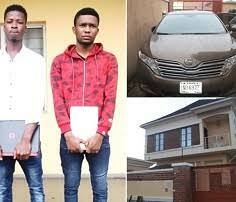 The Economic and Financial Crimes Commission (EFCC) says it has arrested four dropouts for suspected Internet fraud (Yahoo Yahoo). The suspects were arrested in different parts of Lagos, following intelligence report received by the commission. The statement read in part, “They are alleged to have defrauded their victims, mostly American and European citizens, millions of dollars. “The suspects, dropouts, have confessed to have been involved in romance/ marriage scam, Internet advertisement scam, spoofing of emails and interception of business mails. The items recovered from the suspects at the time of their arrest include laptops, handsets and phishing scripts, among others. The anti-graft agency said they would soon be charged to court. See How Volvo cars in Europe use road alert systems to warn each other in the road! Volvo is taking technology that allowed some of its vehicles to communicate with each other about hazardous road conditions and expanding it across Europe in an effort to increase safety, the automaker announced Monday. During the Tesla Model Y launch last week, Tesla teased an image of the coming pickup truck. After the crossover presentation the screen behind the stage played the end credits from the movie Blade Runner, a mere few frames of that cinematic sequence devoted to the image you see above. No one caught it. The miss, and Tesla CEO Elon Musk's comment about "one more thing" prompted a Twitter exchange that briefly involved Musk's shoes, then ended with Musk posting the image for everyone's perusal. Uber has confirmed it will spin out its self-driving car business after the unit closed $1 billion in funding from Toyota, auto-parts maker Denso and SoftBank’s Vision Fund. The Trade Union Congress of Nigeria (TUC) on Friday said that President Muhammadu Buhari has given Nigerians a sense of belonging by signing the new N30, 000 minimum wage. TUC, in a statement, commended President Buhari for signing the bill into law. Tech giants Apple and Qualcomm have agreed to settle all ongoing lawsuits, putting an end to a long-running battle with billions of dollars at stake. "All litigation between the two companies worldwide" has been dropped, the firms said in a joint statement. In segment mostly filled with anonymous kid haulers, the 2019 Chevrolet Blazer stands apart with eye-catching styling inspired by the Camaro. Its driving experience also evokes Chevy's modern muscle car, demonstrating a degree of handling precision not expected for this segment. Certainly, if you're looking for something zestier and more memorable than the segment norm, the Blazer is definitely worth a look. Barcelona and Ajax have both qualified for the semi-final of this year’s Champions League. Barca progressed with a 4-0 aggregate win over Manchester United, after they won 3-0 at the Nou Camp in the second leg. Popular Nollywood actress, Omotola Jalade-Ekeinde has reacted to a statement by President Muhammadu Buhari’s media aide that those making ‘clean money’ in Nigeria are not complaining under the present government. The Blues progressed past Slavia Prague on Thursday, but the striker questioned their second-half display. Olivier Giroud believes Chelsea allowed their intensity to drop in the second half of Thursday's 4-3 Europa League win over Slavia Prague and that allowed the visitors to get back into the contest.